We offer Electronic Software for Disease and Insect Models, Spec 9 Pro Software, Delphin Profi Signal, WQ Smart Sensor Powerful Software. We are engaged in offering Disease And Insect Models to our clients. We have enhanced the pro activity of the in the fight against disease and pesky insects by adding a disease and insect forecast module to meet the latest market trends and competition. It offers you data you collect to forecast the potential for detecting the pests that harms your crop. Price range is affordable as well. Manufacturer : Spectrum Technologies Become more proactive in the fight against disease and pesky insects by adding a disease and insect forecast module to your Spec 9 Pro software. 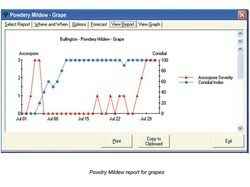 Save money by spraying only when necessary.Quickly produce the documentation when needed to support your IPM decisions. Each package uses field-tested and validated algorithms along with the data you collect to forecast the potential for the appearance of your crop’s most notorious enemies. Models Included: Apple Scab* (Modified Mills, Cornell, Washington State) / Fire Blight (Maryblyt, Cougarblight) / Sooty Blotch/Flyspeck / Insect Models. Models Included: Early Blight / Late Blight (BliteCast) / Insect Models.